TVG's Candace Hare is on with her Aussie cohort Jason, and says the Randwick track is a Heavy 9 ATM. I wonder if US Navy Flag will be a late scratch, as Aiden has been pretty clear about his colt not doing well on heavy ground. It's raining there, and it sounded like the track could be becoming more heavy. If that's true, would that allow O'Brien to legally scratch US Navy Flag? A good 2nd in the G2 Scillachi Stakes in Melbourne for US bred Ballydoyle horse Spirit Of Valor! That track is looking pretty ugly; the horses running before the Everest have chewed up big divots out of the boggy surface. The Everest is going to be a sprint that requires some serious strength and stamina. Redzel just pulled off a Midnight Lute. Talk about peaking perfectly on the right day. Defending champion Redzel wins the Everest Stakes! A great advertisement for syndicates (common in Aus) as ownership is shared amongst various people from all walks of life. But for that person that owns 5% of a horse the excitement is 100%! Who says orphan foals can't win big races?! Big win for the internationals in the Ladbrokes Stakes! They put a camera on Kerrin McEvoys helmet when he rode defending champ Redzel to win the Everest! He was in front the whole way but still worth a look! 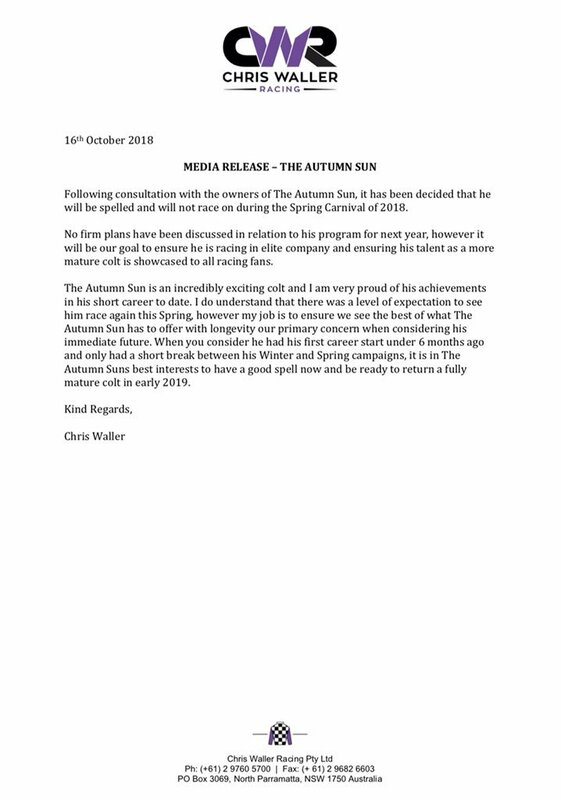 Please see below the latest on Caulfield Guineas winner The Autumn Sun. Connections are very happy with The Cliffsofmoher (AKA Cliffs of Moher back in Britain ) leading up to Saturday's (tonight for us) Caulfield Cup. Almost all the whispers in the build-up to Saturday's Stella Artois Caulfield Cup have centred around Aidan O'Brien's The Cliffsofmoher, better known to European racing fans as Cliffs Of Moher. After Benbatl and Blair House dominated the Ladbrokes Stakes last week locals are convinced British and Irish invaders are the place to start. The sectional-lovers, and that encompasses most race fans down here, point to The Cliffsofmoher's strong closing fractions when finishing two and a half lengths behind them in fourth. Have to think that having Hugh Bowman up is a plus. Aussie-bred Cool Beans (Candy Ride x Win McCool) was third in the Valley View at Keeneland. Dam is a half to Graeme Hall and Harmony Lodge. I'm getting a little worried. TVG hasn't shown any promos for the Caulfield Cup and none of the talent have discussed their betting choices for tonight's races from Caulfield. Is it possible that TVG can't show racing from Caulfield? I now remember that last week TVG was all over The Everest at Randwick, but never showed the same day's stakes from Caulfield. Is Australia like the US, where certain tracks (like CDI-owned here) don't share their simulcast signal with certain racing broadcasters? Phooey. I was really looking forward to seeing the race.